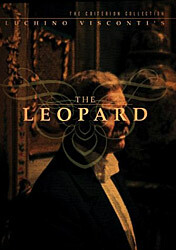 Criterion's DVD containing the new digital transfer of the original 185 minute Italian release of Luchino Visconti's The Leopard is stunning, both in video and audio (yes, despite being simply Dolby Digital 1.0). I've seen the movie twice now, and every viewing leaves me ineffably sad, nostalgic for the end of an age I never lived in. I'm not sure it's possible for me to tire of the Nino Rota score and the performance of Burt Lancaster. The final ball, lasting nearly an hour, is the perfect showcase for the quality of the video transfer, the colors of the lavish tapestries ravishing the eyes. And Claudia Cardinale? Just plain ravishing. Only someone with her beauty could convincingly win the heart of someone as handsome as Alain Delon. The scene in which she invites Burt Lancaster to dance with her, and their subsequent waltz together, is one of my favorite movie scenes of all time. It is so charged with meaning and emotion that it spills off the screen and overpowers the viewer. The movie is also a master class by cinematographer Giuseppe Rotunno, from the start to the final poignant shot. Have you ever been to a museum or palace and been entranced by a painting or sculpture or an old piece of furniture, in the rapture of a nostalgia for a way of life that you never lived? That's how I feel when watching this movie.